Discover north-west Tuscany, where the mountainous scenery of the Garfagnana meets the glamorous seaside resorts of Viareggio and Forte dei Marmi. 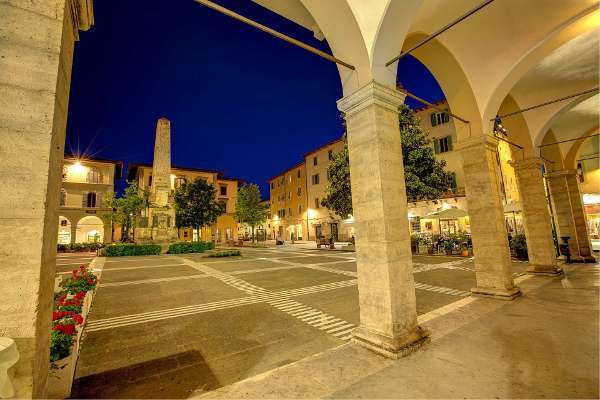 Renaissance Lucca, with its encircling walls, acts as the gateway to this region. South of Florence, stray from the Chianti trail and visit Volterra, an imposing fortified Etruscan town, and Arezzo, whose splendid piazza is host to a renowned antiques market. The towns of Castiglion Fiorentino and Cortona are smaller, but no less enchanting. 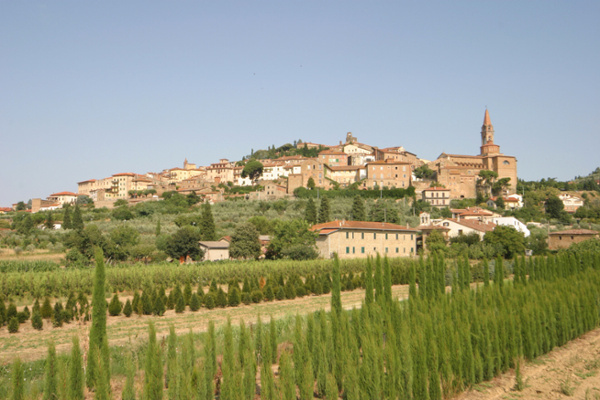 Further south, the tree-clad hills of Chianti become the slopes of the Crete Senesi: rolling hills stretching towards bare ridges, topped with a single line of cypress trees or a Romanesque chapel – a view often depicted on postcards. Stumble across living masterpieces of the Renaissance in the form of picturesque towns such as Pienza, Montepulciano, Montalcino and San Quirico d'Orcia. Tuscany is known for its hearty, simple food. Try crostini (small pieces of toast with liver, olive or tomato paste) to start, followed by 'pici' (thick pasta from Siena), and then a 'bistecca alla Fiorentina' (a huge T-bone steak grilled with a little olive oil and herbs). End the meal with some pecorino cheese from Pienza, drizzled with a little honey, or cantucci (small almond biscuits) served with vin santo, a dessert wine. Tuscan wines are notably famous and it is worth stopping off at one of the many vineyards to sample the product! From Chianti Classico to Montepulciano di Abruzzo to Brunello, the choice of red wines is staggering in this region and with plenty of vineyards offering the chance to sample the product, you will no doubt come across some little-known gems. From village events to celebrate the ‘vendemmia’ (grape harvest) to renowned music festivals, there is something to entertain everyone. Large events include the Palio horse race in Siena, the Feast of San Giovanni in Florence, and the Cortona Tuscan Sun Festival. The historic hilltop towns are perfect settings for medieval pageants that evoke times gone by. These can involve races and horseback tournaments, costumed parades, and displays of flag waving, falconry, archery. Some of these medieval themed festivals include Arezzo’s ‘Giostra del Saracino’, the ‘Bravio delle Botti’ in Montepulciano, and the ‘Gioco del Ponte’ of Pisa. Whatever the event, you will be sure that music, fireworks, food and wine all play an important part. Spring is a wonderful time to explore: wildflowers carpet the meadows, the air is fresh and the temperatures are perfect for days out sightseeing. Summer is hot and dry, with temperatures often exceeding 30°C. This warm weather often extends into September, prolonging the summer. Towards the end of the month and into October, the air becomes crisper, heralding the onset of autumn in all its glory. The principal airport in Tuscany is Pisa, served by scheduled and 'no frills' airlines from many UK airports. The smaller airport in Florence is served from Gatwick. Bologna airport is also an option for the northern part of Tuscany. 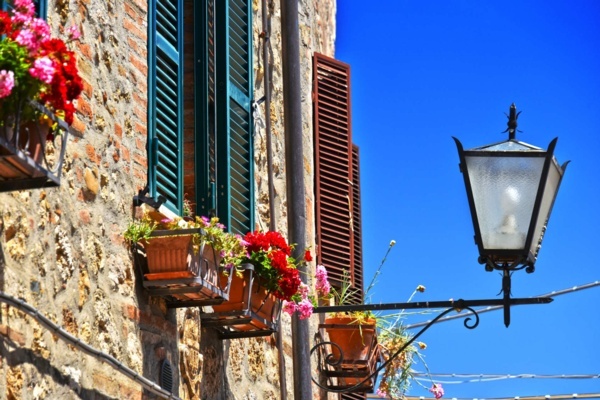 This pretty town is situated in the Valdera, a picturesque landscape of rolling hills, woodland, tiny villages and vineyards between Pisa and Volterra. A typical Tuscan town with narrow streets leading to the main piazza surrounded by ancient buildings, Lajatico nowadays is famous for being the home town of Andrea Bocelli, the award winning singer/songwriter. 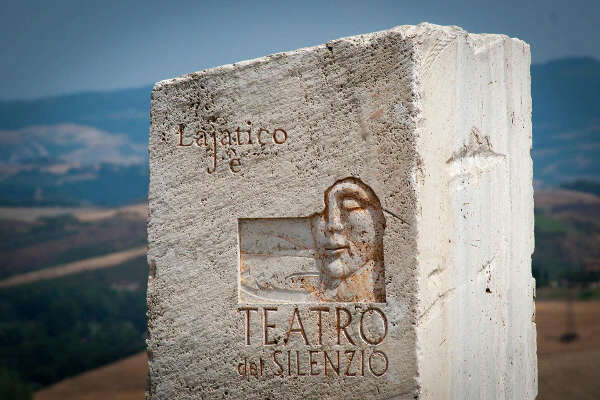 Every year for one night in July, he gives a concert in the ‘Teatro del Silenzio’, a natural amphitheatre just outside the town. The surrounding countryside is peppered with places to explore: villages such as Orciatico, Montecatini Val di Cecina, Casciana; wineries producing both reds and whites (the village of Terricciola hosts a number of wine related events) and finally a trip to the coast is possible too (in just under 1hr). 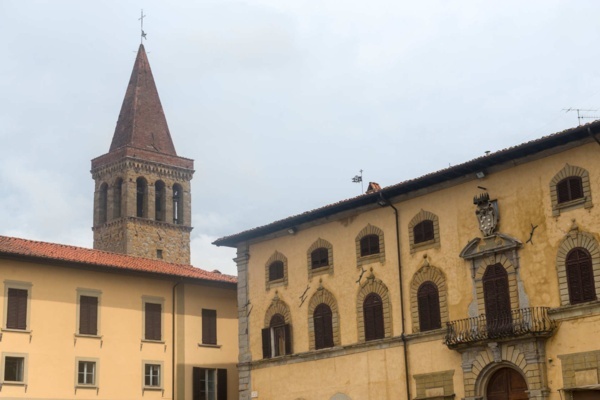 Today the walled town of Sansepolcro has a range of shops, banks, supermarkets and cafés, plus a lively market. Dating back as far as the year 1000, its history is evident in the many churches and impressive public buildings that are scattered through the town. Many are ornately decorated with terracotta medallions crafted by Andrea della Robbia, and overflowing with Renaissance works of art including Piero della Francesca’s famous ‘The Resurrection’, which can still be admired in the Museo Civico. Many events and festivals are held here throughout the year including the ‘Palio della Balestra’, a traditional crossbow contest with rival town Gubbio. 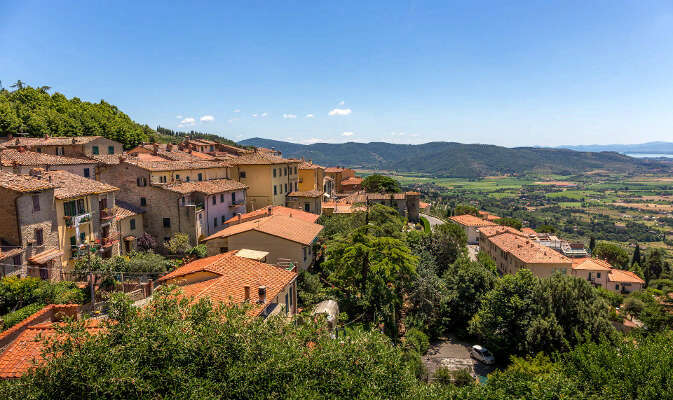 Set high on a hilltop and affording a breathtaking panorama of the Tuscan countryside below, the medieval town of Cortona is a little Italian gem well worth discovering. Full of architectural treasures highlighting the Renaissance period the keen photographer is rewarded with a photo opportunity at every turn. The narrow, shaded streets are dotted here and there with colourful window boxes and an eclectic mix of cafés, art galleries, restaurants and boutique shops. In contrast, the stunning main square is flooded with sunlight and offers a great spot to sit with a coffee and just soak up the atmosphere. The square is dominated by the town hall and clock tower which may be familiar to some as a setting used in the film 'Under a Tuscan Sun'. A medieval hilltop town in the beautiful Val di Chiana area, Cetona is a proud member of the prestigious club of the most beautiful towns in Italy, ‘I Borghi più belli d’Italia’. 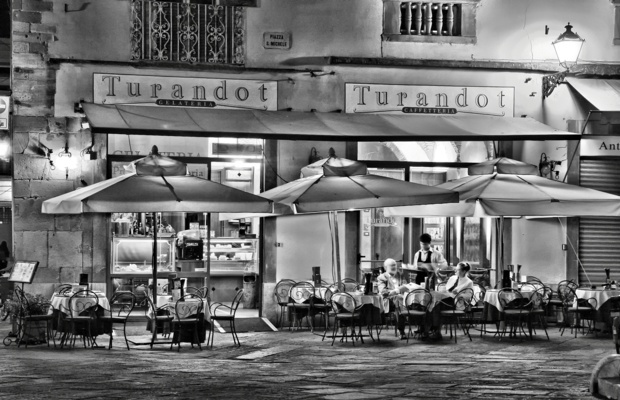 The old town follows the typical Tuscan pattern of a central piazza, where an outdoor market is held every Saturday. The elegant Rivellino Tower sits at one end of the piazza, and there are shops and restaurants in and around the square. Among Cetona’s notable buildings are the 13th century Church of the Holy Trinity (La Collegiata), the Convent of San Francesco and Belverde Archaeological Park. Lovely places to visit in the vicinity include Sarteano with its Etruscan past, Montepulciano with its excellent wines and the Pietraporciana reserve for walking and enjoying nature. The town of Borgo a Mozzano has local shops and restaurants to offer, and has a long history evidenced by medieval buildings in the oldest streets. It sits on the Serchio River, which snakes its way south towards Lucca and out to the sea near Pisa. 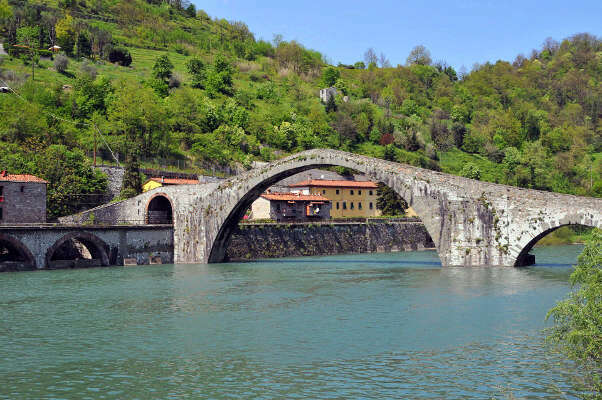 The town’s main claim to fame is its famous and iconic bridge, the Ponte della Maddelena, also known as Ponte del Diavolo (the Devil’s Bridge). Legend has it that the devil himself built the bridge… but we’ll leave you to discover the full story for yourself! 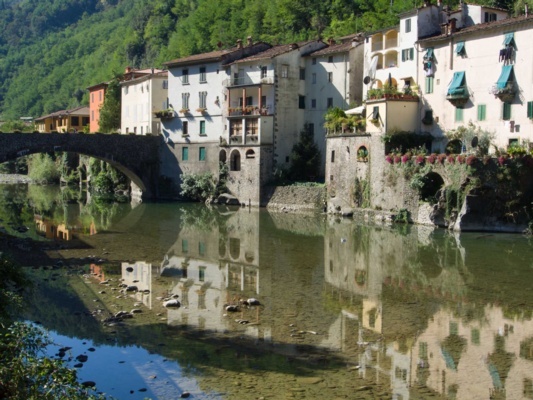 Going upstream, the pretty towns of Bagni di Lucca and Barga are worthy of a visit, and beyond that the mountains of the Garfagnana beckon. Bagni di Lucca is a very pretty town sitting beside the River Lima, the main tributary of the Serchio. Known for its hot springs since Etruscan and Roman times, it became a fashionable spa resort in the 19th century when the sister of Napoleon Bonaparte made it her summer residence, and many famous writers and composers then came to ‘take the waters’. Many of the spas have now closed but visitors can still bathe at the Terme Bagni di Lucca which offers a variety of treatments and three thermal pools. A thriving little town with a great atmosphere, Bagni di Lucca is lovely to wander around, its elegant Tuscan villas a reminder of its past – see if you can spot the houses (indicated by blue plaques) where Byron, Shelley et al stayed. The little town of Vicchio is in the beautiful Mugello region, a short distance north-east of Florence. Vicchio was the birthplace of two famous Italian painters, Giotto and Beato Angelico; a large statue honouring Giotto stands in the town’s main square. Make sure you include a visit to the Beato Angelico Museum, Giotto's home in the hamlet of Vespignano and the Cimabeu's bridge. Legend has it that this is where the painter Cimabeu encountered Giotto painting a sheep onto a rock and was so impressed that he took him in as an apprentice at his workshop in Florence. On the outskirts of Vicchio, Lake Montelleri is a lovely spot for a picnic and a leisurely afternoon on the lakeside or for the energetic, there is canoeing, mountain bike and hiking trails. There are direct trains to Florence from the station in Vicchio, for an easy way to visit this magnificent city. The medieval old town of Castiglion Fiorentino is a well kept secret, closely guarded by the substantial city walls that surround it. Once used to keep enemies out, the impressive Porta Fiorentina stone archway at the entrance to the town now invites visitors in its heart. The narrow shaded streets are lined with pretty pastel-coloured buildings, their intricate wooden doorways opening into shops and restaurants here and there. Take time to enjoy a coffee in the sunny Piazza del Municipio with its unique stone columned loggia offering the perfect frame to the picturesque view stretching out to the east. The town is crowned by the Torre del Cassero, a semi-ruined tower on a grassy hilltop right at the centre. Built in 1347 by the Perugians, it is possible to climb the wooden stairway to the summit for fantastic views across the Val di Chiana and Val di Chio. Lucca is a delightful small city to wander round, with extremely well preserved walls encircling it. Alternatively, it can be explored by rickshaw, or by hiring bicycles. 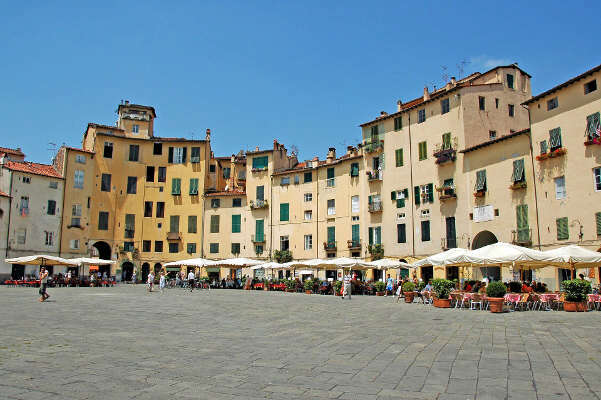 At the heart of the city, the beautiful oval-shaped Piazza del Anfiteatro is wonderfully atmospheric, and there are numerous boutiques and restaurants to discover. 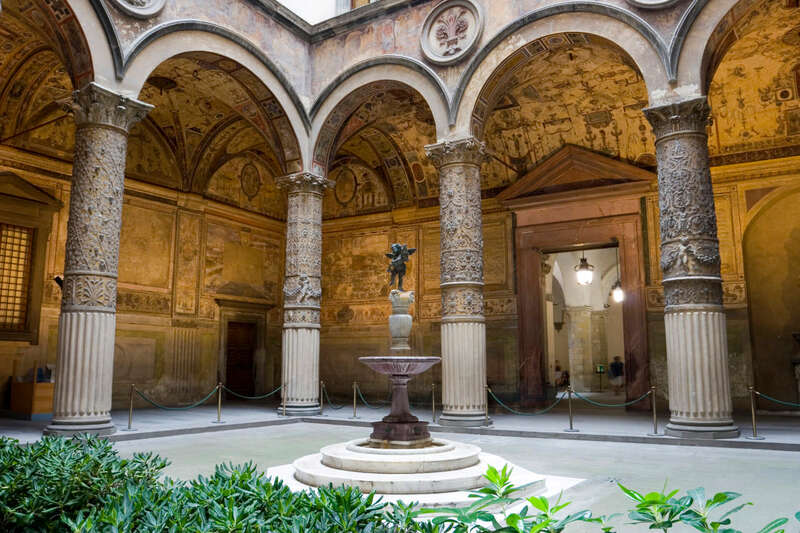 Lovers of art and architecture will be in their element, as Lucca contains many lovely churches including Romanesque masterpieces like San Frediano and San Michele, and the picture gallery at Palazzo Mansi with its collection of Medici pictures and opulent rooms decorated in silks and tapestries. Likewise, the Villa Guinigi National Museum sketches in Lucca’s history through a variety of objects from medieval woodcuts, busts, Roman statues and some allegorical pictures by 18th century artist Pompeo Batoni, a son of Lucca. 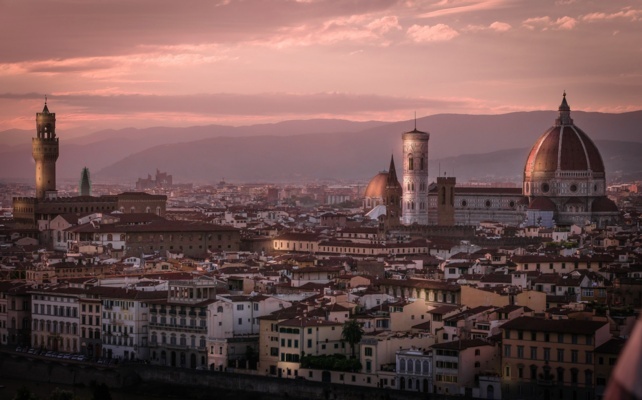 One of the most beautiful cities in Italy, if not the world, Florence (Firenze in Italian) is not to be missed. Surrounded by hills, the city sits either side of the River Arno in a natural bowl and harbours an overwhelming abundance of Renaissance ‘palazzi’, museums and churches that are world famous for their beauty, art and history. Although this makes it busy year round, there is a great atmosphere and it is a beautiful city to simply wander round at your own pace. The principal sights are the magnificent cathedral and campanile, the Ponte Vecchio bridge lined with jewellery shops, the Uffizi Museum and the Piazza della Signora, the hub of the city with some its most celebrated buildings but also a great spot to have a cappuccino and people-watch! One of the larger towns in the area, Montepulciano can definitely be classed as a Renaissance beauty. Atop a steep hill, its impressive high walls remain intact and the narrow cobbled streets within are still lined with historic stone buildings. After a hard climb to the top you will find Renaissance palazzo and incredible views. Montepulciano is, of course, famous for its wine which can be tasted in the Palazzo del Capitano on Piazza Grande, or accompanied by a platter of cheeses and meats in a pavement café in the historic centre. The little town of Camporgiano lies in a valley which divides the mountain ranges of the Apuan Alps and the Appenines, an area known as the Garfagnana. Villages steeped in history, green and mountainous terrain, and a cuisine all of its own make it a firm favourite for nature lovers and those seeking an authentic Italian experience. 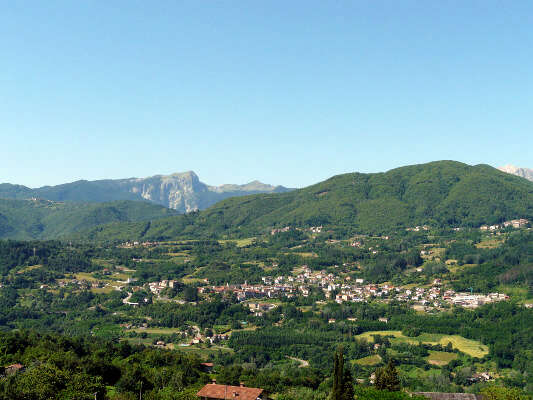 The whole area of the Garfagnana can be explored from Camporgiano, including places such as Castelnuovo di Garfagnana, Borgo a Mozzano and the Orecchiella National Park. The houses, shops and restaurants of the town are dominated by the fortress, thought to date back to the 1300’s although subsequently enlarged and rebuilt over the centuries. Colle di Val d'Elsa is a town of two halves. The main (new) town at the bottom of the hill has a number of shops and restaurants, and the old town perches on a ridge above, a beautiful walled town with cobbled streets and stone buildings. The town prospered in the past thanks to its strategic position along the Via Francigena, the medieval pilgrimage route from northern Europe to Rome, and its proximity to important towns such as Siena, San Gimignano, Florence and Volterra. In the 13th century the area became famous for its saffron, and it is still produced here today. In autumn mornings the strands are collected and dried at a temperature of not more than 40 degrees. The town is now also known for its crystal glass production, which visitors can learn about at the Museo del Cristallo. 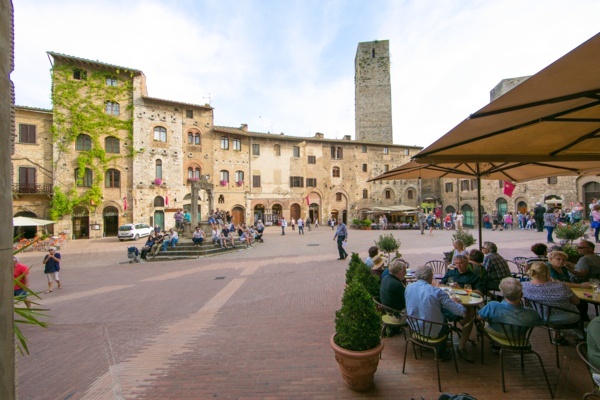 A UNESCO World Heritage site, San Gimignano is well known and deservedly popular. The town originally had over 70 towers, ostensibly built for defensive reasons but also to bolster the egos of the owners who all strived to build the highest! Originally it was possible to cross the town by rooftop but now only a few towers remain, nevertheless creating an inspiring skyline. There are many fine examples of medieval and Renaissance art to see in the town, whilst the Torture Museum offers an alternative, albeit slightly gruesome visit. The streets and squares are blessed with plenty of cafes, restaurants and boutiques for relaxation after all the sightseeing. In the surrounding countryside, there are lovely walks along the the ‘Strade della Vernaccia’ (the Vernaccia wine route) so you can combine a meander through the vines with tasting the wines. Guided tours are also available around the local cellars and wineries.